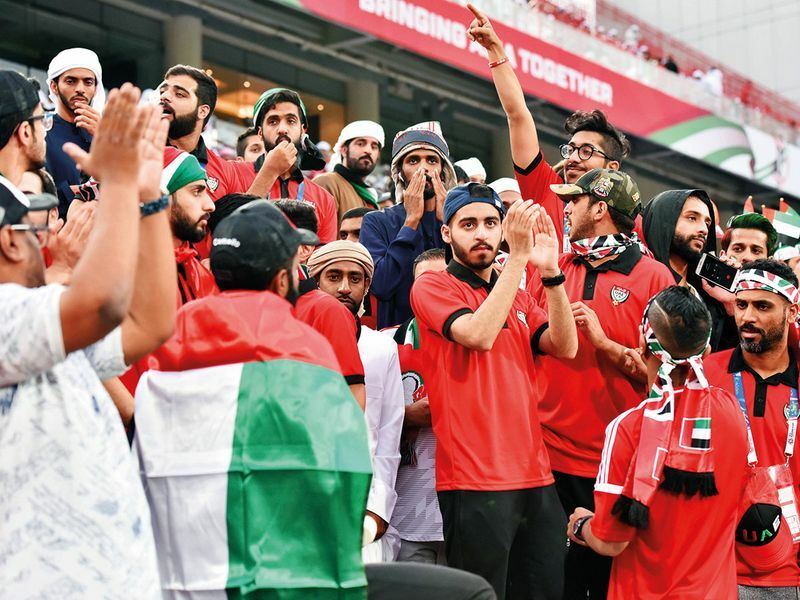 Abu Dhabi: The UAE’s challenge in the AFC Asian Cup came to an end with Qatar handing them a 4-0 defeat in the semi-finals at the Mohammad Bin Zayed Stadium in the capital. Boualem Khoukhi, Almoez Ali, Hassan Al Heidos and Hamid Esmail scored a goal apiece for the winners who have so far kept a clean sheet in this tournament. Qatar will be meeting Japan in the final on Friday, who had defeated Iran 3-0 on Monday to make it to the summit clash. The atmosphere was electrifying for the semis in Abu Dhabi with every seat in the stands occupied. The host fans were out in force and they vociferously got behind the team but couldn’t inspire them to victory. After taking a cautious approach trying to take a measure of the their opponents, Qatar shot into lead through a counter in the 22nd minute. Khoukhi, after being sent through on goal by Akram Hassan Afif, made the run from the right and sent in a grounder which should have been easily grabbed by Khalid Eisa. However, the goalkeeper, who has been good so far in the tournament, erred and the ball slipped under his outstretched hands into the goal. Following that setback, the UAE brought some urgency into their play. In the 27th minute, UAE’s Esmail Al Hamadi’s header off a Walid Abbas cross was well collected by Qatar goalkeeper Saad Al Sheeb. Three minutes later, Ali Mabkhout’s header from the centre of the area missed to the right following a cross from Amer Abdul Rahman. Despite the pressure exerted by UAE, the maroon brigade managed to widen the lead in the 37th minute. Ali was given enough space by UAE defence and he curled in a right footer from the left side of the box to the bottom right corner. Ali, thus, swelled his goals tally to eight for the tournament. UAE coach Alberto Zaccheroni had to do something drastic to turn around the fortunes after the interval. Veteran striker Esmail Mattar was introduced after the change of ends in place of midfielder Amer Abdul Rahman. Ace striker Ahmad Khalil also took the field shortly in place of another playmaker Al Hamadi to press for the breakthrough. Mabkhout also came close to scoring in the 52nd minute on a Khalil release. However, that top-class effort from just outside the box was well tipped over the bar by an alert Al Sheeb. Mattar was doing everything he could to get the UAE back into the game but he was also taking a lot of workload of running up and down. It was eased a bit with Mohammed Abdul Rahman coming in the 70th minute and UAE started to pile on the pressure. In the 72nd minute, Khalil managed a header from the centre of the box, off a Bandar Mohammed with a cross right but Al Sheeb again did well to tip it over. With the UAE pressing, there was always an opportunity on the counter and Qatar went on to make it 3-0 in the 80th minute. Al Heidos, latching on to a through from Afif, scored with ease once he was past the UAE defence-line. A red card for Esmail Ahmad for violent conduct added more misery and Qatar hammered the fourth goal through Esmail to make it 4-0 in injury time. Despite a brave run to the semi-finals, most of the UAE players, including Mattar, were inconsolable after the loss.